Lent: Trial or long-awaited cleansing? For Orthodox Christians, Lent lasts from March 18 until May 5 this year. During this time, many believers observe special dietary restrictions. For some it is a trial, for some, a time of increased spirituality. Unlike in many Western faith traditions, fasting in the Russian Orthodox Church is serious business. Believers are supposed to refrain from some foods on regular fast days, which are observed on most Wednesdays and Fridays, and there are four major fasts in the Russian Orthodox calendar during which serious dietary restrictions are imposed. The most important of these is Great Lent. 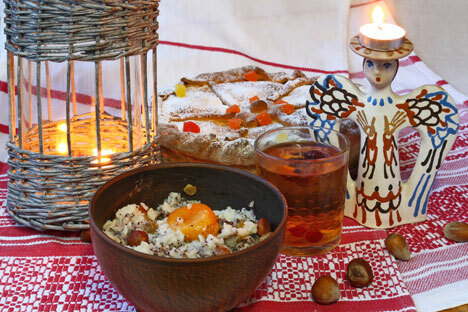 It lasts seven weeks – from Forgiveness (or Cheesefare) Sunday, the Sunday at the end of Maslenitsa, until Easter. This year, Lent began March 18 and will end May 5. During Lent, Orthodox believers effectively become vegans. They must exclude all meat and dairy products from their diet as well as wine and olive oil. They must subsist on starchy foods, vegetables and fruit, which can only be prepared with vegetable oil. At the end of the third and six weeks of the fast, fish is allowed and on Saturdays and Sundays, a little red wine is permitted. During Holy Week, however, the fast becomes even stricter. From Monday until Wednesday, only raw food is permitted; believers can eat boiled food with a little oil on Maundy Thursday. Good Friday is a total fast, during which no food can be consumed, on Holy Saturday food boiled without oil is permitted, and then, finally, after the Easter Vigil, once again all foods are allowed. The purpose of fasting is not to practice deprivation, but rather to free the mind from focusing on earthly things – such as food – in order to spend more time on prayer. There are, indeed, people who follow the fasting restrictions to the letter. And there are special calendars to help them remember what is allowed and when. Some people fast for purely religious reasons, others in an attempt to improve their health or lose weight, and others simply because everyone else they know is doing it. Restaurants make is easier by providing special Lenten menus. In Russia there are genuinely religious people who consult with their priest ahead of Lent and observe all the rules. There are also people who fast for the sake of “cleansing their body”, or losing weight, or as an experiment, or simply because everyone else is fasting. RBTH spoke to some of them about their Lenten practice. I fasted only once in my life, three years ago. I had long envied people who could give up certain foods just like that. I’d always wanted to test myself and find out what it was like. I didn’t prepare for Lent in any particular way. I just abruptly gave up dairy products, meat, fish, and alcohol. I was proud of myself at the time. In my family no one else was fasting, and sometimes I had to prepare food for myself separately. When buying food in shops, I carefully read the labels to make sure that there were no eggs or milk in the ingredients. At work Lenten food was also a problem, so I mainly ate nuts and dried fruits. I fasted through all of Lent and observed all the rules, despite not feeling very well for the last two weeks. Then I realized that with my experimental motivations and my boasting I had offended the very essence of Lent. I’m not a very religious person, but when someone asks me if I believe in God, I answer unequivocally: “Yes.” That’s why I now consider my experiment more a disgrace than an achievement. Since then I’ve stopped trying to prove my “goodness” with such one-off performances. Instead I just try to be a little more honest with the people around me and with myself. For me being overweight is a key problem. I’m not plump, but even so I have to get rid of five or 10 pounds every once in a while. In winter I tend to put on a little weight, and by summer I try to get rid of it, so Lent is the perfect opportunity. I believe in God, but I only observe Lent. I first fasted when I was 16. It was a bet with some girlfriends, to see who could do it. Of the three of us, only one couldn’t cope; she felt dizzy and disoriented. Her doctor forbade her from continuing to fast. Lent helps me shed up to 10 pounds. I think it’s not bad at all when something pleasing to God helps you improve your figure. Mama makes me different kinds of kasha (hot cereals), salads, and meatless soups. I also love nuts, especially pistachios, so I can eat nothing but nuts and dried fruits all day. My friends tease me for eating hamster food, but I don’t care. Unlike them, I at least try to live according to the commandments. I kept my first fast a very long time ago. Then I did it less because of my faith, than because of my love for my wife. She was already very devout and kept all fasts. I remember I was so afraid of being left hungry that I always gave myself double portions and generally ate a lot more than I do ordinarily. As a result, I not only didn’t lose weight, I gained more than 10 pounds. But then I was just trying to understand what this was all about. I was trying on a new culture. Later I realized that to have faith in God you don’t have to look for any proof. When I stopped looking for some catch, I found things a lot easier. All the cells in my heart were suddenly full. And now Lent for me is not a torment, but on the contrary a long-awaited spiritual cleansing. I try not to watch television, not to be distracted by the endless uproar about this or that. During Lent there appears an unusual lightness, satisfaction, and sense that you are doing everything right. Now Lent for our family is a usual thing; we never even ask ourselves whether or not we will fast. We freeze a lot of vegetables for winter, not just for Lent, but as a matter of principle. Still, during Lent these vegetables are just what we need. We make pasta, kasha with mushrooms, various vegetable ragouts. Our menu during Lent is hardly meager; we just omit certain foods from it. We have two children, but they of course do not fast. They drink milk and eat meat. When our older daughter turns seven, we’ll explain to her what this is all about. And then she can decide for herself if she wants to fast or not. If you are afraid that you will not be able to manage fasting I can tell you that if you think of it as starvation, then of course you’ll have reason to be afraid. As for me, I always look forward to Lent. I see it as a chance to cleanse myself spiritually and physically. To pray on an empty stomach is better. For Orthodox Christians, Lent is a time to make sense of one’s attitude to the world and to God, a chance to work on oneself. You see, we more often sin in our thoughts, than in our deeds. And during Lent it is far harder to keep from sinning. The brain is such a fine substance, you cannot command it. That is true of anyone, including me. I always counsel my parishioners to work on themselves during Lent, to fight for their soul. The first fast is hard for many because they consider it a torment. But Lent is not that, it’s always hard to raise oneself up to another level. Just try walking up to the 16th floor in a high-rise. But to tumble back down is easy. It’s the same in spiritual work. To take heart can be difficult, but to fall is no problem at all. You should think not about what’s in your stomach, but about what’s in your head.